(Online Interactions Not Rated by the ESRB) Download the manual for this game by locating the game on http://marketplace.xbox.com and selecting “See Game Manual". 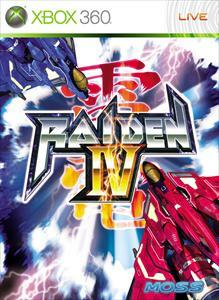 "Raiden IV", the latest version in the acclaimed arcade shooter has arrived on the Xbox 360! Fight yoru way through countless enemy squadrons using four devastating weapons types. Connect to Xbox LIVE to upload your scores and replays. Share and watch replays and see if you stack up against the best ACES in the world. Get ready for action in this latest version with never before seen levels and content! That mysterious character that appeared in the series in the shadows is a surprise participant in Raiden! A fairy is added to the game. There are no refunds for this item. For more information, see www.xbox.com/live/accounts. A legendary fighter returns! From the 1990 "Raiden" series, this fighter has been added to the game. Defeat the enemy with the powerful weapon! There are no refunds for this item. For more information, see www.xbox.com/live/accounts. This is the "Raiden IV" theme package. There are no refunds for this item. For more information, see www.xbox.com/live/accounts. The "Raiden IV" pack comes with five different gamer pictures. There are no refunds for this item. For more information, see www.xbox.com/live/accounts.